Following the success of both Lassie and Flipper in the USA, it is not really surprising that the Australians wanted to have their own superstar pet too. 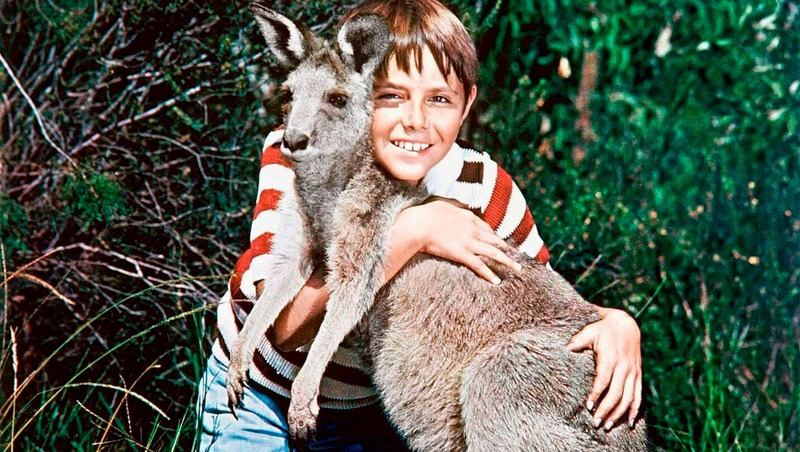 So was born Skippy the Bush Kangaroo, an Australian television series created by John McCallum in 1967. It tells the adventures of a young boy called Sonny Hammond and of his best friend, a kangaroo called Skippy. Sonny lives in the Australian bush with his brother and his father, the Head Ranger of Waratah National Park. Sonny’s mother is said in the 48th episode to have died soon after his birth. In addition to that, the Hammond family is visited by guests such as Clancy Merrick (the daughter of another ranger) and Dr Steiner (a German doctor), who contribute to the action in various episodes. The series covers different themes, from pet loyalty and Australian wildlife to family values, with some clichés anchored in the 1960s. Skippy is a very clever kangaroo who can communicate with humans, understand what they say, and hold objects in her pouch. Thanks to these skills, she is able to help her masters and save the day. The main actors are Ed Devereaux (as Matt Hammond), Garry Pankhurst (as Sonny Hammond), Ken James (as Mark Hammond) and Tony Bonner (as Jerry King). Skippy, however, was played by nine different female Eastern Grey Kangaroos. As opposed to apes and dogs, however, kangaroos have low mental capacities, which made it impossible for the film crew to train them. They therefore used sticks covered with fur to pretend that Skippy was moving her paws. Animals on the set were regularly inspected, which was not the case on the set of Flipper, where dolphins were mistreated. The show, which is divided into three seasons, counts 91 episodes, the last of which was aired in 1969. The series was shot in northern Sydney at the Ku-ring-gai Chase National Park and the adjacent Waratah Park (now known as Waratah Park Earth Sanctuary). The show was filmed in colour, translated into 25 languages and aired in 128 countries including Iran, Czechoslovakia and the Soviet Union, with each week 300 million viewers around the world. Despite the fact that the series is over, there have been various reruns in the 1980s, and occasionally until 2009. 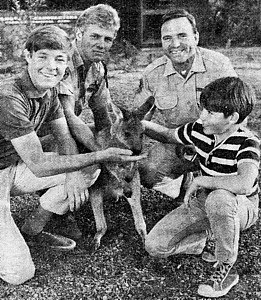 In 1969, a film based on the series, called Skippy and the Intruders, was released and in 1992 the series was revived under the name The Adventures of Skippy, presenting an adult Sonny who has become a ranger in the wildlife park. All of this has contributed to the series becoming very popular in the audience’s mind. Instantiating that is the fact that the image of Skippy the Bush Kangaroo was used in advertising campaigns, such as the one for Rolo chocolate Cookies. Furthermore, a documentary was produced as recently as 2009. In conclusion, it is the joyful features of Skippy the Bush Kangaroo, but also the universal themes, which have been popularized by reruns, remakes, translations, and reminded by several implications in advertising campains, that have contributed to the amazing and extended success of the series. Eventhough it originally aims at a young audience and broadcasts a vision of the world that is typical of the 1960s, it will probably remain an important part of Australian culture.